The season has officially gone from slightly cooler to freezing and dry here in Alberta. We've had two early blizzards have to shovel snow instead of raking leaves. Needless to say my skin wasn't prepared for such a brutal drop in temperatures and I am feeling it. 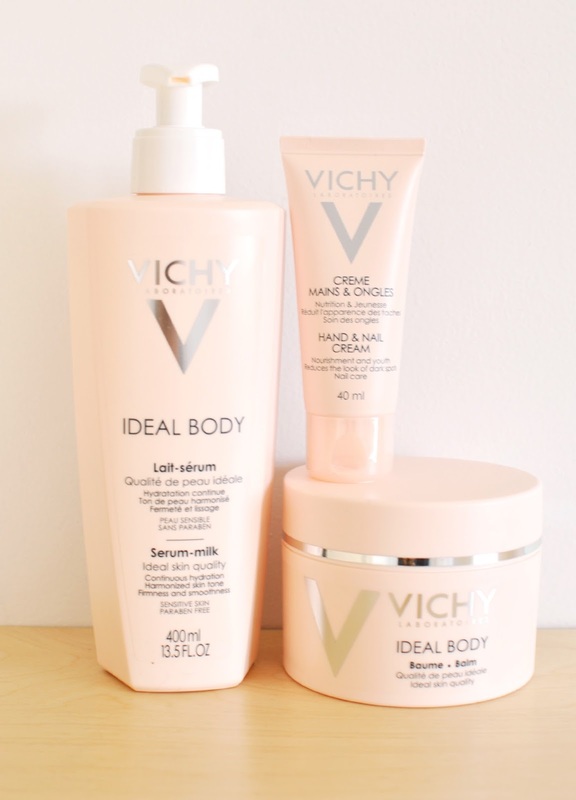 Lucky for me, Vichy just released a new hand cream: the latest product to join their Ideal Body line. My hands start getting dry as soon as Summer ends. They are more exposed to the cold, and I do like to wash them often. I cannot live without hand cream. Regular lotion just doesn't cut it. I recently put the body milk, body balm and hand cream to the test on my very dry skin. Here's what I have to say after a few weeks in this dreary weather. This lighter lotion is ideal for morning use: it is pretty liquid and easily absorbed into the skin. While it is not enough on its own for my dry skin in the Winter, it is perfect for an every day use in between heavier moisturizers. It leaves the faintest, prettiest shimmer on the skin and would be great as a Summer moisturizer too! I don't mind the classic Vichy scent, but I'm not crazy about it either. I do find that I want to rinse my hands after applying this as its texture is very velvety (and I'm a little bit OCD), but it is not sticky at all. I love this body balm! It is creamy and smooth, absorbs well into the skin and does not feel heavy despite being so moisturizing. It contains shea butter which makes it the perfect moisturizer for your legs (mine get extremely dry) and is not sticky at all. I also love that it has firming properties - I need all the help I can get in that department. I first noticed how light this hand cream is. It's a plus in my book, since so many hand creams are so tick you can barely get them out of the (already tiny) tube. You'll be able to use this one until the last drop! It also feels light on the skin and while I would probably want it to be a tad richer, I love that it does not make your hands greasy for hours. This cream has an almost powdery finish which is pretty unique and makes it the perfect hand cream to keep in your purse and use at work during the day. How do you fight dry skin in the colder months?